Two big news items today. The first is that The (free!!) second edition of The Golden Keg magazine is now out and available for your consumption. Featuring myself and other gold makers including Wowprofitz, Novitsh, and 8Bit Bruce, the magazine is a monthly compilation of articles that are only available in one place. The topics range from noobie gold making, to farming, to Warlords of Draenor speculation (guess which one I wrote), this magazine has information for any level of WoW gold maker out there, and the articles within are only posted in the magazine. If you don't want to miss out, be sure to check it out! You can find the latest edition of The Golden Keg at this link, and you can also find our first ever edition from this past March at that link as well! If you are a gold maker who is interested in writing for The Golden Keg you can contact me via email at PhatLewtsGold@gmail.com.
.@GoblinRaset @Wowprofitz Boosted a 90 for competition. Started with 150g, played for 1 second. Have fun beating 540,000 gold per hour. As always my stance during this holiday, as with all WoW holidays is to ignore the holiday and carry on. At any level there are more productive things to be doing with your time than competing with others for colorful loot eggs. If you need the achievements though, more power to ya! I still have one Springstrider from last year's, but I'll definitely be watching the market to see if I can snipe a few. I can usually sell them down the road for 10k, I'll be shopping for anything below 4k to flip. The plainstrider mounts are very boring to me but there is indeed a market for them, I'd imagine mount collectors that miss the holiday for the most part, which is a market we can see growing throughout this summer as MoP drags on and achievement hunting is on the rise. 3 Years of Phat Lewts! So I missed it by about a week, but April 12th, 2011 was the date of the first post ever posted on Phat Lewts' Gold Blog, making this past April 12th 3 years since my first post! So let's look back to that original post, the one that got things started. As you know I'm generally not one for fanfare, so there was no "introduction post" to Phat Lewts' Gold Blog, just a post titled Accountant. Receiving a whopping 87 views to this very date, my first post was a bit of a dud. You can check it out, I edited the text formatting a bit. The original text was black and impossible to read on my current background, but I preserved the wonky layout and text of the original. You may also notice I was posting under the name Dwhittman, which at the time the name of my main character (an Orc Warlock). Shortly after that first post I wrote my second post TradeSkillMaster - Posting & Canceling. Looking at the screenshots in that post, I can safely say that both TSM and my Blog have come a long way since! In contrast to the 87, that post saw over 2,000 views by today, more of a testament to TSM than my own writing ability. By May of 2011 I wrote my 5th post, and fell off the map for almost 6 months thereafter. Probably lost in the nether as one of the defunct gold blogs that started out as a great idea, but fell into obscurity. I came back in November of that year, and I've written at least 2-3 posts in every month since (and usually many many more). If you want to check out some of my older posts, you can find my entire Blog Archive in my left sidebar. One last thing in the reminiscing department! I did not have all of these saved, but I went to archive.org and grabbed various screenshots of the different layouts of my blog over the years. I also added when I created the logo I used for a majority of the three year run. Of course as a numbers man I have to give you some statistics at this point. My post with the most views of all time is Your Guide to Spirit of Harmony receiving 28,383 views. It came out near the beginning of MoP and was obviously a hot issue at the time as people got used to their new trade skill item. My highest number of site referrals come from google with nearly 100,000 (~10%) of my pageviews coming from them. Last but definitely not least, I want to thank you all, the readers of my blog for supporting me through these years. I'm quickly nearing 1,000,000 pageviews (also in the left sidebar), and without an audience I'd be writing to myself and this blog wouldn't exist. Through these years I've really enjoyed taking part in and interacting with the gold making community in WoW. It's amazing what happens when people come together from different walks of life and all around the world to combine and discuss their different approaches to gold making. I've really enjoyed being a part of the communities over at The Consortium, on the TSM IRC, as well as on reddit, and everyone who has taken the time to comment on my blog posts or Youtube videos. It's been a fun ride, but look for much more to come as we move forward to WoD! As you may have heard, Blizzard is planning a 4 part series of blogs on Garrisons Soon™, but we've been getting bits and pieces of information from Blizzard interviews as well as datamined information. We discussed this at length on the latest episode of The Drunken Musings Podcast which I co-host. Quite honestly I'm a bit disappointed on how Blizzard is blatantly dragging their feet on releasing information, but I guess they have a long time to stretch it out over. One of the most important things that we have learned from Blizzard so far is that "Garrisons are tied to every aspect of max-level tradeskills so if you want to advance your tradeskills, you have to build that up in your garrison." I'm going to try and summarize what we know so far, of course related mostly to gold making. Everything involved with Garrisons, both buildings and the actual Garrison itself have 3 levels. Level 1 is the base level you receive, and you have to work up to Level 2 and Level 3. The exact mechanics on how you do this for each is not yet established, and I'm not going to speculate on that at this point. Just assume it involves some sort of work/grind/thought. The most interesting part here is the different benefits for the Garrison Building Levels have been datamined, and are going to be the focus of this article. So basically, you're unlocking 1 extra type of plot every time you level your Garrison. So building choice is going to be an important component in maximizing gold making. The default buildings on the Garrison that are relevant to gold making are the Mine, Farm and Fishing Shack. Each has a unique function, and I'll cover them in this section. The mine seems to have 2 benefits. The first is that it will produce it's own materials daily, and as it levels it will gain holding slots from 1 to 2 to 4, which is common among all of the profession related Garrison buildings. You will generate one "batch" (vague but it's all we have) of goods per day, and hold them in storage. As the building levels you'll have to visit your Garrison less to harvest your goods, as it will have more storage slots. The Mine also has Ore nodes within it, each level unlocking a new "mineshaft", the final level unlocking Rich Nodes. Whether or not these will be farmable by non-miners is up to speculation. So the Farm is also called an Herb Garden, and it's precisely that. Possibly the WoD Tillers farm, it works similarly to the farm, expanding in size as it levels. The tooltip states that you'll be able to "grow and harvest useful herbs", so this makes me think it'll be possible for non miners to harvest the nodes in the mine (or maybe your followers will have professions), but honestly it's about 50/50 at this point in my opinion. Seems to be a WoD farm, and right now one of the possible specializations is the ability to automate the picking of herbs from the garden. It will be interesting to see what we have to pick against for that specialization, but I hope there's a similar mechanic in the Mine. The fishing shack is the only one among the 3 that does not seem to produce it's own materials. It unlocks a fishing vendor that provides bait, tackle, and "support" (think Ben of the Booming Voice). As you level it, it will also unlock 3-5 fishing daily quests. The Devs have also mentioned that there will be a fishing pond on your Garrison. We do not know the mechanics on the fishing dailies, but I think there could be some interesting opportunities here if Blizzard plays their cards right. I'm not saving the best for last, I'm giving them to you right now, the category that contains the profession buildings! One of the big flipping markets currently is leveling gear. Will the leveling gear market die in Warlords of Draenor with the item squish? This question has been on the minds of everyone involved in these markets since the news of the item squish came out. Based on datamined stat changes, the answer is looking like a resounding yes. For those of you unfamiliar with the markets, there is BoE leveling gear in the 77-79 and 80-84 brackets that are from an expansion ahead of where you are currently leveling. For example the 77-79 gear has Cataclysm stats for a WotLK leveler. These additional stats make them ideal for leveling, both in increasing output and efficiency, as well as being able to faceroll BGs. Of course there's gold to be had in this market, to read more on the strategy you can check out my old post on it here. Including a "this is early alpha and mostly speculation" disclaimer here and now, but I just wanted to focus in on some of the cool changes to engineering I mentioned previously in my post about the items datamined off the Alpha as well as some changes that Blizzard employees Zarhym and Celestalon talked about during their Final Boss Podcast Appearance (link goes to relevant discussion). Engineering has never really been a true "gold making profession". Never in the history of World of Warcraft has someone said "I want to make gold in a productive fashion" and someone suggested "You should definitely get Engineering to rake in the gold". In fact if I made a list of all the crafting professions in order of gold making prowess/priority to get, Engineering would probably be on the bottom of the list. No, you don't get Engineering for gold making, you get it for the cool perks. PvPers and PvEers alike swear by engineering for the awesome on demand burst damage and speed bursts, others enjoy being able to summon Jeeves or a mailbox at the drop of a hat, while others still prefer to use the quirky and entertaining vanity items that sometimes backfire, and the hilarity that ensues. It seems that Blizzard is trying to change that in Warlords of Draenor, by giving Engineers a stable source of possible income. Engineering as a gold making profession in MoP has been pretty blasé to say the least. They got their Ghost Iron Dragonling trinkets and matching Gears to sell, which did fairly well. A couple expensive mounts to craft and sell, and end game Scopes and guns that required Spirit of Harmony to craft. Overall, not an impressive lot. In Patch 5.1, during the 5.2 Beta, Engineers were promised new gold making avenues in the form of 2 pets and a mount, that went along with a new Blacksmithing Lightning Steel Cooldown. Very cool indeed, but it was not meant to be, and the pets and mounts were delayed to 5.4. Now I must say, for a few months the mounts and pets sold well, and there was quite a big profit to be made, but every crafting profession had the same to say during 5.4, if not better. A couple months down the road and these new mounts and pets are going for mat price on most servers. Not very impressive from a gold making standpoint. With both the Alpha Patch Notes we saw that Blizzard is focusing on a more "balanced" view in WoW, even more so than in Cata/MoP. They've changed racial buffs across the board, and have balanced classes and profession buffs as well. Engineering is not a safe harbor from these changes, in regards to items such as Nitro Boosts and EMP generators. GUMM-E - MOLL-E usable by non-Engineers. Ultimate Gnomish Army Knife - A Gnomish Army Knife that does not require Engineering to use. Also, the rez can be cast in combat. It would seem that on top of the other changes that Engineers will be able to sell some of their long staple profession items to the common folk. Now I know that a lot of Engineers aren't going to be pleased with these changes. I'm not a huge fan of Engineering as I focus mainly on gold making, but some of these vanity items that are slated to be usable by non-Engineers is what makes Engineers fun to play. I know that a lot of Engineers are most likely going to be upset with the changes to their profession, but as far as gold making goes, I think that it will do a lot to make Engineering a much more viable profession for making gold. It is going to be interesting to see how they implement this, I would think selling these items such as something like a Thermal Anvil that has charges would be the best route, but as of the current moment it doesn't look like they're doing that. Maybe having the items usable by non-Engineers attached to a daily cooldown of sorts. To me that seems much more likely. I'd personally want a portable mailbox on literally all of my alts, so it's something I'd be willing to spend a great deal on, depending on the price, although I'll be crafting my own. It will be very interesting to see how these changes come out once they're implemented on the Alpha/Beta. So Blizzard has released the Official Alpha client, and the nice folks over at MMO-Champion and Wowhead have gotten their hands on it and have been parsing all the data. There's quite a bit of interesting news, I honestly can't cover everything because it's just a bit of a data dump, but I'm going to highlight the things/items that I found interesting. Just to point out, most of what I say here is complete speculation, no one has actually been on WoW's Alpha client yet, so everything that is known now is solely from data files. Metamorphic Crystal - Self described as a "Key component in the most potent alchemical concoctions of Draenor", this seems to be a BoP item that will most likely be either Alchemy's daily CD or a key crafting component. Alchemist's Cauldron - Seems to be the current source of Metamorphic Crystals and Alchemical Catalysts. Based on these items, it seems like we will be seeing quite a revamp of Alchemy, which sounds excellent to me. They've added some placeholder pots and placeholder flasks. You can check them out, but there's not much we can glean right now. What's interesting is that there are no current primary stat flasks, and that flasks come in Normal and Greater varieties. Engineering is getting quite a few items that seems to look like either Engineering items that will be able to be used by non-Engineers and/or replace old recipes (Jeeves, MOLL-E, etc.). I think this has the potential to upset quite a few Engineers, but we do not know about any of the other changes to the profession, so hopefully the sobbing is kept to a minimum. Some new blue items (presumably crafting items): Megawatt Filament and Oglethorpe's Missile Splitter. Gearspring Parts - Found by fixing or creating devices. Bottled Elements - New crafting reagent, seems similar to the Alchemical Catalyst above. Walter - A BoP clone of Jeeves. Even has Jeeves in the current tooltip of the spell. Findle's Loot-a-rang - seems to be a non-Engineer version of the Loot-A-Rang. Two new guns for level 100s, ilvl 675 and 700 have been added as well. For some more of the changes check out these items. No crystals yet, but it's still early alpha. There are also a few recipes which have been datamined. Honestly these look really raw, and I wouldn't read too much into them, but currently only Ring, Cloak, Neck (that's new! ), Weapon, and Glove enchants have been added in the Alpha. Take a look around if you're interested, not much to see. It seems that there will be a bit of a change to fishing, first of all if you're for some reason interested all the new meat names can be found here. The interesting part to me is that looking at their tooltips, you'll notice that some of the Fish from Warlords of Draenor will be caught with specific types of bait, and there are multiple sizes of fish, let's take a look at an example. So as you can surmise from this data, it seems you'll need a certain bait to catch each fish, which exists in certain zones. Then, based on the size of your fish, it will (somehow) yield meat, presumably with meat quantity determined by the size of your fish. Quite the change here. There are also two new feasts in the Alpha, Feast of Blood and Feast of the Waters, presumably being land animals and fish. There are also a ton of new cooking items that can be found at this link. Chameleon Lotus - Seems to spawn randomly from herb nodes based on it's tooltip. Creative name IMO. A bunch of new glyphs were added, we are not yet sure how they will be introducing these into the game, but they will more than compensate for the "Auto learned glyphs". Check out all the new glyphs at this link. Starglazed Leather - Seem to be the new blue leather piece. Stitched Starglazed Leather - an interesting tooltip, seems to be pieces of the blue leather stiched together by herb stems...interesting. So while there are not currently any recipes logged for any of these professions, we got a whole slew of what seems to be craftable gear for BS. There are way too many links to include here, but I'll be using all of these items as an example. Check that out to follow along. So there seem to be two tiers of rare items, ilvl 637 and 643 (and one weird outlier of 646). Of these items, one seems to have a chance to proc a red gem slot, and another has a chance to proc a prismatic gem slot (I'm gleaning this from their item #s from the seemingly identical items being drastically different). They all require level 91. It also seems that these 4 items have the chance to be epic, or are able to be made epic. Important to distinguish, but we do not know the mechanic yet, so too soon to say. Of those epic forms there are 4 different ilvl tiers: i650, i656, i666, and i672. Now Hwoo has mentioned gear procs scaling by profession level, don't know if this has anything to do with that. It seems like a very complex mechanic, whatever it's going to be. There are also items added called Embodiments, you can find them all here. What I think these will be are the mechanics that Hwoo has mentioned, that have the ability to reroll the stats on a random proc crafted item. No details how they work or where they come from, but they're there. Whew. I'm sure I missed a thing or two, but here is a plethora of information for you to go through from the Alpha. Hope you enjoyed! So if you did not see, Blizzard has released the Alpha patch notes for Warlords of Draenor. The next WoW expansion is not yet in public beta testing, but since they are hosting the alpha on a public servers that can/will be data mined, they've released a plethora of official information, and I highly suggest you go check it out, especially if you are interested in other aspects than gold making, as this is what I will primarily be covering in this article (of course). Not much information that we did not already know, garrisons are listed as not yet available for testing on the Alpha, so we likely will not learn about how to best use these for quite some time. If you are interested in reading the short Garrison section it's available here. So Blizzard has decided, since "in order to get glyphs, characters need to visit an Auction House (and potentially pay way more gold than an average character of that level has yet)", that they are going to make some glyphs become available as you level. The relevant portion of their patch notes can be found here. I have not gone through all the glyphs yet, but looking through there's a good amount of useful glyphs, but definitely not every glyph that any spec/class would want or need. If no one else does, I'll probably do a breakdown of the glyphs by source at some point, but I'm hoping someone else will (hint hint). I think from everything in these notes, that it is most definitely the most interesting change. There's not much written on the Professions front, which is kind of disappointing considering all the talk that has been going around on unofficial outlets from Blizzard developers recently. The big change to note from these patch notes is that they're removing all the "direct combat benefits of professions". To me this is excellent news. Getting professions to max was nearly essential whether you were a PvPer or PvEer to maximize your potential, and with these changes I believe we will definitely be seeing quite a few less people leveling crafting professions, which is good for crafters. They've also added mechanics that make mining and herbalism easier to level. You can now farm any mining or herb node available with the profession, with yield from that node being determined by skill level. In theory this should bring more mats to the marketplace, so for crafting based gold making, to me this is great news, but should also supplement the lower number of herbs and ore due to no flying during the first patch. So as you can see, a slight bit of news, but nothing big as far as professions. The main focus of these patch notes seems to be focusing on PvE and PvP changes to class and race benefits, which I'm sure everyone is interested in, so I'd highly suggest checking this out to see how they plan on changing your class. Since they've mentioned that their client can (and will be) data mined, I'm sure that we will have even more information once that comes to fruition. I was hoping for details of the new profession mechanics (such as how they're changing prospecting/milling), but it seems that they won't be releasing that at this time. 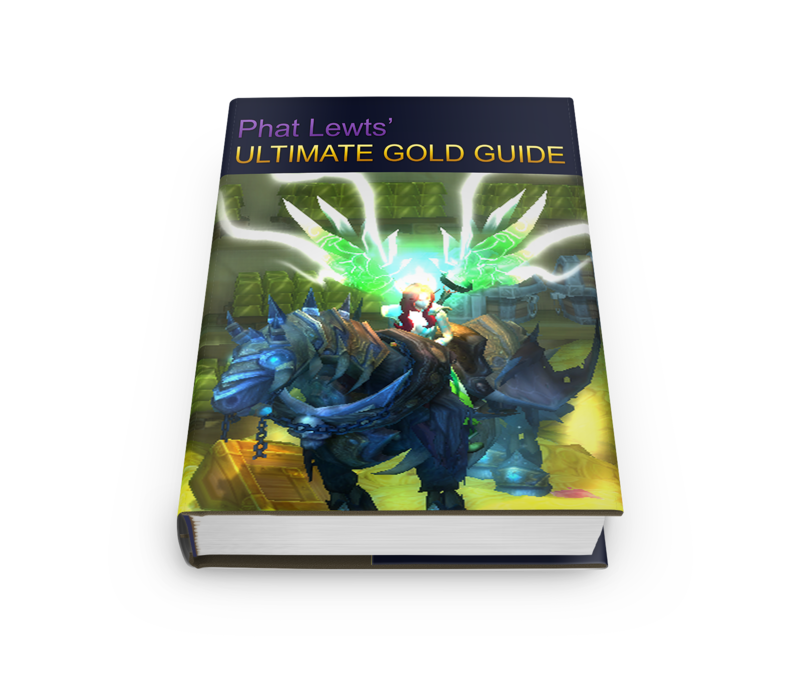 Apologies to everyone who actually wanted to purchase a guide, but my post advertising Phat Lewts' Ultimate Gold Guide was indeed an April Fool's joke, as quite a few suspected! Each and every one of these guys put together longer testimonial video than my own 3 minute spoof gold guide video, so a big thank you to all of them for taking the time to do that, it really was the believability glue that held the whole thing together. Why'd ya do it Phat, Why?! Last April maybe a day or two after April Fool's I had that brilliant idea, kind of like that brilliant comeback you think of 3 days after an argument you had with someone while in the shower, too little too late, that I should have made a post that I came out with a gold guide, so I decided that I'd do it this year. Yes this was a year in the making (although I did not start working on it until a week ago). I hope that some (most) of you found it entertaining, and know that even if I were to ever come out with a guide (I probably won't, sorry) that I would not advertise it in such a "traditional gold guide" format as such. I did however have a TON of fun putting that page together, and I genuinely hope you all enjoyed it. At the time of this posting the post had over 2,500 views, and the button click counter (which I only added ~23 hours ago) was up to 722. "I just subscribed 2,212 times to the $20 per month guide because I can't get enough of this! I sort of can't afford food now and I think my wife's going to divorce me, my kid can't afford his amoxycillin anymore and my cat's started to eat the lint from under my couch, but I don't care! Ten million gold never seemed so close. Thanks, PhatLewts, you're the best." That comment is just amazing, I was considering having written testimonials in my gold guide post as well as the videos, and if I did, this is the type of comment I would have wanted. Also there were quite a few people who believed that this guide was real, and I'm going to chalk it up to my beautiful and accurate emulation of traditional gold guide advertisements, and I'm flattered that you all wished to purchase my guide. Also I got quite a few PMs and comments on how I sold out, and thank you to those who understand me, but fret not, it was all in fun. Hope you all enjoyed the post! Other guides promise gold, I guarantee gold cap. That's right, your favorite gold blogger has now come out with an all inclusive comprehensive guide to making gold! Learn all the gold making secrets that I've been personally using for years to earn over 10 MILLION GOLD! Are you sick of not being able to make any gold while your friends sit on tons of it? Want to buy that fast flying you've dreamed of, but never could afford? Need to purchase the greatest and rarest items from the Black Market Auction House?